The announcement of capital funding for the long awaited Sallins by-pass and M7 upgrade projects is welcome. Having campaigned strenuously for years on this issue, these road projects will bring a dramatic improvement to the lives of people living in Sallins and travelling through as well as the thousands who use the M7 everyday. A by-pass for Sallins was first talked about in the late 1990s. After many stop-start attempts at the much needed project, I welcome the announcement today of funding for this. However, as we’ve seen many times before, we won’t be sure until the actual roadworks under way. The Government had already stalled this project at the start of the year. I have obtained a breakdown on the cost of the three delayed roads projects at the recent Naas Municipal District meeting. As I’ve stated on countless occasions over the years, the Sallins bypass is vital for Sallins and taking the gridlock out of the village. The M7 widening is equally important to prevent the rat run that was worsening in Kill and Johnstown since Newlands Cross opened and that the Osberstown Interchange at Kerry Foods was vital to hook it all together. I have been consistently keeping the pressure on for these projects to progress and Minister Donohue stated on Wednesday morning that he acknowledged the importance of these projects for the area and indeed region. I have now obtained figures showing that the estimated cost of Osberstown Interchange is approximately €16 million and of Sallins By Pass is approximately €39 million. The highest project in terms of cost is the M7 widening with a price tag of €55 million. The government need to keep their promise to deliver on these projects. These projects are not just important for the locality, but they have greater importance for the wider Leinster region and the busy Dublin-Cork motorway route. 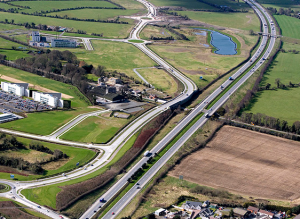 In a major setback for the critical M7-Sallins bypass road projects, it was announced last week that KCC is now being asked to fund a major part of these road projects from its ‘own resources’. The Minister for Transport says two out of the three M7 road up-grade projects should be funded from Kildare County Council’s “own resources”. The total cost of these linked schemes is €110 million. Minister Pascal Donohoe has already stated that funding is not available in the short term. In response to a parliamentary question, he now says “with regard to the Osberstown interchange and the Sallins bypass the improvement and maintenance of regional and local roads is the statutory responsibility of each local authority”. Consequently, KCC may now be obliged to find the money for these schemes itself, supplemented by State grants. To put this in context, the cost of these schemes would be equal to about 90% of KCC’s entire annual budget. This is not good enough for government to abdicate responsibility like this and jeopardise these works. 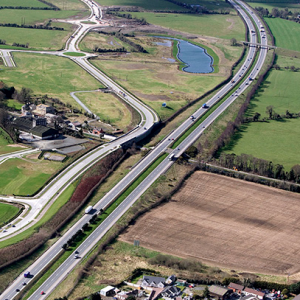 M7 near Millennium Park where Sallins bypass would intersect with new 3-lane motorway. It’s extremely disappointing the recent news that the government have refused to grant funding for the Sallins bypass, Osberstown interchange and M7 widening projects. Minister Pascal Donohue confirmed in Dáil questions last week that funding would not be forthcoming for these projects. The total cost for all 3 projects was estimated at €110m. These are absolutely vital projects, not just for Sallins and the Naas area, but for the whole county. I know the Sallins bypass is eagerly awaited not just in Sallins and the immediate area where it will bring huge relief but right across North Kildare where everyone knows the journey time it will take to get past and into Naas or out the far side. Sallins village itself is stuck in a warp also that every single planning project is told it can happen after the bypass. Local business organisations, residents, the whole community is up in arms over this abandonment of Sallins and the Naas area.